With its 4K content limited to Netflix and YouTube, many might consider the cheaper Now TV Smart Stick a more attractive option to the Smart Box. However, the box does make a lot of sense if you manage to get a good deal that includes a couple of subscriptions thrown in, and it is future-proofed for the addition of other UHD services down the line. Now TV is a godsend for those wanting Sky's sports, movies and TV channels without a contract and has become renowned over the years for producing its own, cheap streaming devices to watch them on. 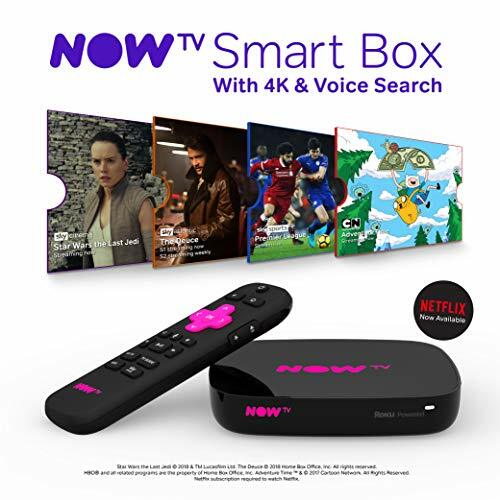 The Now TV Smart Box with 4K & Voice Search is its most recent addition and, as the title suggests, brings Ultra HD (4K) video to the party for some content. It is one of the cheapest streaming boxes on the market to do so, with most 4K compatible equivalents costing considerably more. And, while it faces competition from Amazon's 4K Fire TV Stick in the sub-£50 price point, that particular rival doesn't offer access to Now TV. So, if it's Sky's channels you want and you don't fancy going the whole hog with a Sky Q subscription, this box represents the most advanced option for the money. However, the big question is whether it offers enough over Now TV's own cheaper solution, the HD Now TV Smart Stick, to justify spending more than £30 extra? Read on to find out. The latest Now TV Smart Box replaces the last couple of generations but continues a similar design aesthetic. That's because it is made by Roku – a streaming device manufacturer Sky has a stake in – and borrows from the set-top-boxes released under that brand in the past. It is fairly small and inoffensive, apart from garish pink lettering on the top. It matches the general Now TV style though, and it's not too bad as you're likely to hide the box in an AV cabinet anyway. The remote is similarly adorned in fluorescent-style colouring, but you do get used to it after a while. And at least the control stands out when you're hunting for it, even in low light. It's a decent remote all told, not needing line of sight to work - and this helps when you do tuck the box away in a cabinet. It has a microphone and dedicated button for voice search too. There are also shortcut buttons for the TV Guide, Kids channels, My TV (to jump to your recently viewed shows to continue watching), and the Sky Store to purchase or rent movies. And, you get volume buttons on the side that will also work on your connected television. The box itself is simple in terms of connections. There is an HDMI output, Ethernet port and a microSD card slot to expand the storage if you need to install more apps. An HDMI cable and power supply is included and it is remarkably simple to setup. Plug it in, follow the quick and easy on-screen instructions and away you go. The main user interface (UI) is a tweaked version of Roku's own menu system. The main difference is that you get Now TV channels and programming front and centre. You can still use the box even if you don't subscribe to any of the paid options Now TV offers, but you're really missing out if not and the third-party app selection is not as expansive as on other streaming devices. Plus, while you can access Netflix, BBC iPlayer, ITV Hub and other alternative streaming services, you'll be constantly presented with content suggestions from Now TV, which might irk if you have no intention of subscribing. Basically, see this Smart Box as a streaming-only version of a Sky box. You only get the best from it when you have access to several of the pay-for options, whether that be one of the Entertainment, Sky Cinema, Sky Sports or Kids passes, a couple or all of them. One of the benefits of Now TV over other paid TV solutions is you can opt in/out of the passes as and when you fancy, only having to pay each month with no minimum term for each (bar sports content). For Sky Sports, you can opt to pay a daily or weekly fee as well, which is handy when you only want to watch a specific sporting event. When you do have access to Sky's content and channels, the menu system provides an excellent way to find the shows and/or films you would like to view. It is well laid out and simple to navigate. The search - through voice or manual input - is thorough and works well. The app store is very similar to the channel store on Roku devices, although it is nowhere near as populated. It's great that there's also access to the Sky Store, for movie rentals and purchases, but there are a fair few apps missing in comparison to other media streamers. The most popular ones are present though, so that might be all you need. The main benefit afforded by the Now TV Smart Box over its Smart Stick stablemate is 4K Ultra HD video. However, don't expect Now TV's own content to be presented in that format. As has been the way since Now TV first launched in 2012, its own video streams are restricted to 720p. That's not even Full HD. We can understand why that was the case seven years ago - average home broadband wasn't as speedy or stable back then - but it's baffling why it's still the case. Maybe parent company Sky wants to differentiate between its easier-to-access streaming solution and the premium pictures of Sky Q? Or maybe it is just gearing up for the launch of the full Sky Q through internet experience. Either way, it puts the images offered by the Now TV Smart Box (or any other Now TV app) at a disadvantage when compared to other streaming services, at least when it comes to its own native content. In all honesty, even at 720p, the pictures are fine - clean and crisp enough for only video evangelists to really criticise. We even ran our Box on a 65-inch LG OLED TV and Sky Sports' output looked great. The audio on Now TV's own content is also only in stereo, but trends have shifted from multi-speaker setups to soundbars and in recent times - so most won't notice. Those with proper home cinema arrangements might want to consider an alternative, though. In terms of the additional applications, such as BBC iPlayer and Netflix, you get better resolutions and audio output - mostly in 5.1 surround sound, but with the capability of up to 7.1. At present, Netflix and YouTube are the only services that makes good use of the Ultra HD capabilities of this box. Others could come later down the line, but if you want to match the Now TV device with a 4K TV, you're really only doing so for Netflix and the occasional UHD cat playing a piano on YouTube. And in that case, we can't help but feel that those with a 4K TV are likely to have one smart enough to offer both apps directly. The Smart Box doesn't have HDR (high dynamic range) either, so a smart TV Netflix app might even be a more advanced option. For everything else, the £15 Now TV Smart Stick does exactly the same job, just limited to 1080p. So if you don't need Netflix or YouTube in 4K, you could definitely save yourself a bob or two. The Now TV Smart Box is a very good, fast, nicely designed and laid out streaming solution. However, it doesn't have enough about it to recommend over its far cheaper sibling. And with Now TV content still limited to 720p resolution, there's just not enough to sell it over its competition. When it was first announced, the Smart Box was the first major media streamer to offer 4K for under £50, but it was soon matched with the Amazon Fire TV Stick. Roku has also dropped the price of its excellent Roku Streaming Stick+ to little more and that has much of the fizz of the Now TV offering and more - after all, it's made by the same company. We can see one good reason for the Smart Box to exist, however. If you manage to find one on a deal with included Entertainment or Sky Cinema Passes, the price is much more attractive. Get one month of Cinema and one month of Entertainment and the 4K Now TV box will only set you back the equivalent of £25 - a bargain in that respect. Plus, it shouldn't be dismissed that the box is proofed for other 4K app support in future. When the BBC iPlayer is more active in the Ultra HD space, this device will be ready and waiting to deliver it. That might be enough for you to invest that little bit more in the meantime. With its new £59 price point, the smaller stick - which is made by the same company - offers more content in greater resolution streams than the Now TV box. If you want 4K content with HDR too, Amazon's solution is the best going. Sure, you can't get Now TV access so some content will lack (Game of Thrones being a big one), but as a streamer with Netflix and Amazon content access it's very hard to beat.